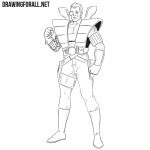 On our site there is a very large number of well-known and not very famous comic book characters. 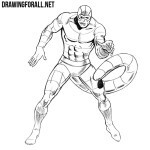 And this list today will be enlarged with a lesson on how to draw Doctor Nemesis – a scientist who participated in the creation of the Human Torch. 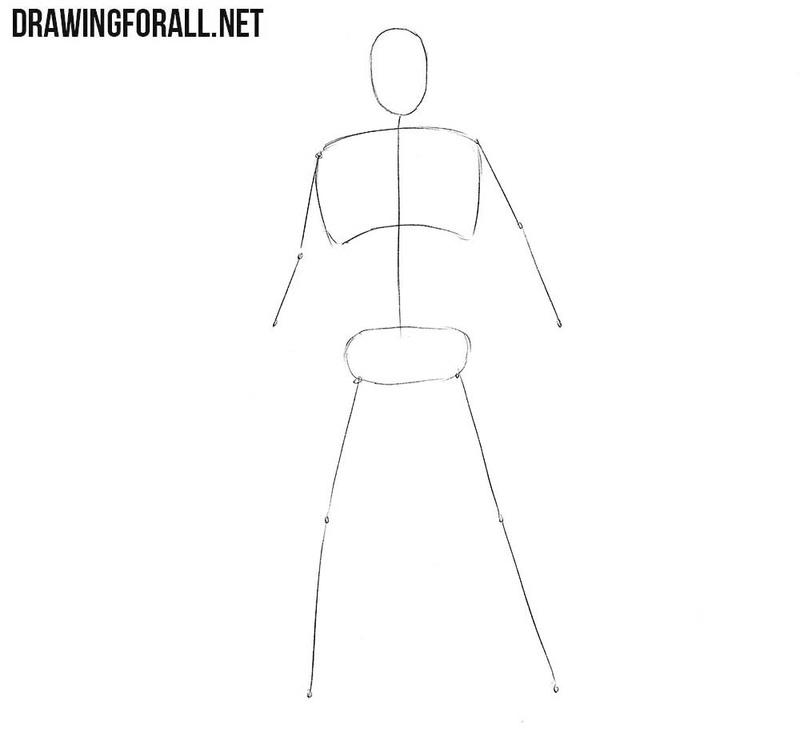 Here we see quite a standard figure of a man, so we will apply the appropriate principles of drawing. Begin with a head, drawing it in the form of an oval. Next, outline the line of the spine, with the chest and pelvis on it. At the end of the step sketch out the legs and arms with simple lines. Now we sketch out two lines intersecting in the center of the face. Next, sketch out the neck and torso, slightly tapering at the waist. With the help of simple geometric figures, we sketch out the arms and legs. Do not forget that at the first steps we need to use very light, almost transparent lines. Now let’s take a look at the basic details in the drawing. On the head we sketch out the eyes, the mask and the outlines of the hat. Next, go to the torso, sketching the outlines of the jacket, shirt and tie. In the right hand sketch out a weapon. Next, sketch out the outlines of pants and move to the next step. So, let’s get down to drawing the final details. And as always, we start with the head. 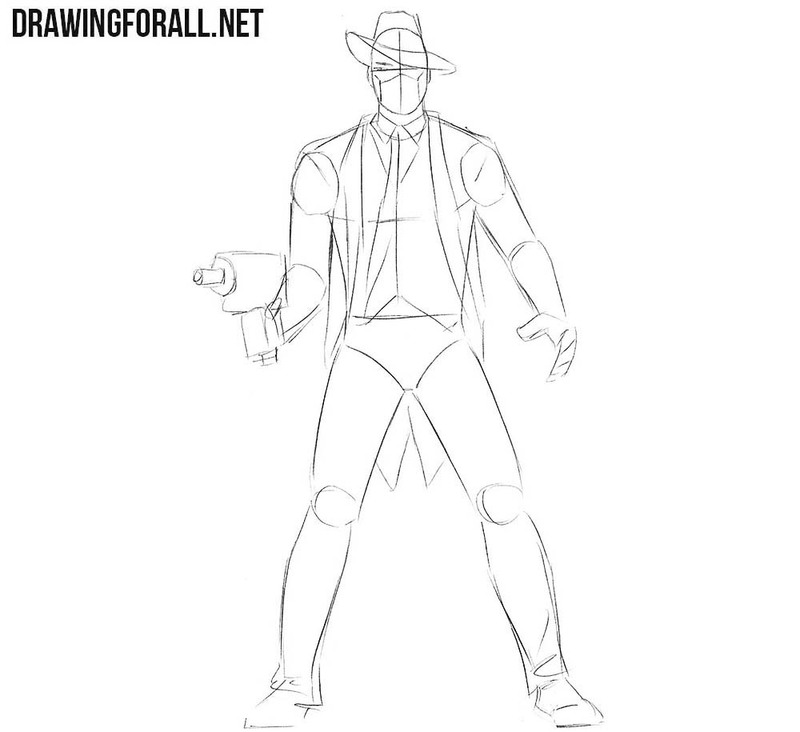 With the help of clear lines, we will need to accurately draw out the outline of the hat here. Next, draw out the eyes, mask and outlines of the jaw. Do not forget to erase unnecessary lines. Now let’s move on to the torso. Here, we also need to draw details, gradually erasing all unnecessary lines. 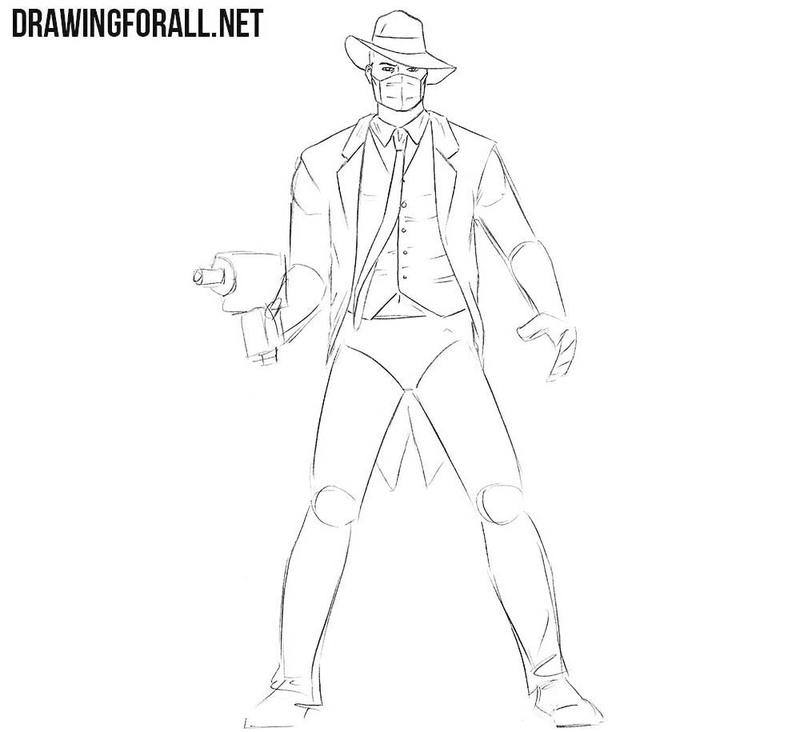 With the help of clear and dark lines, carefully draw out the outlines of the jacket, tie and vest. 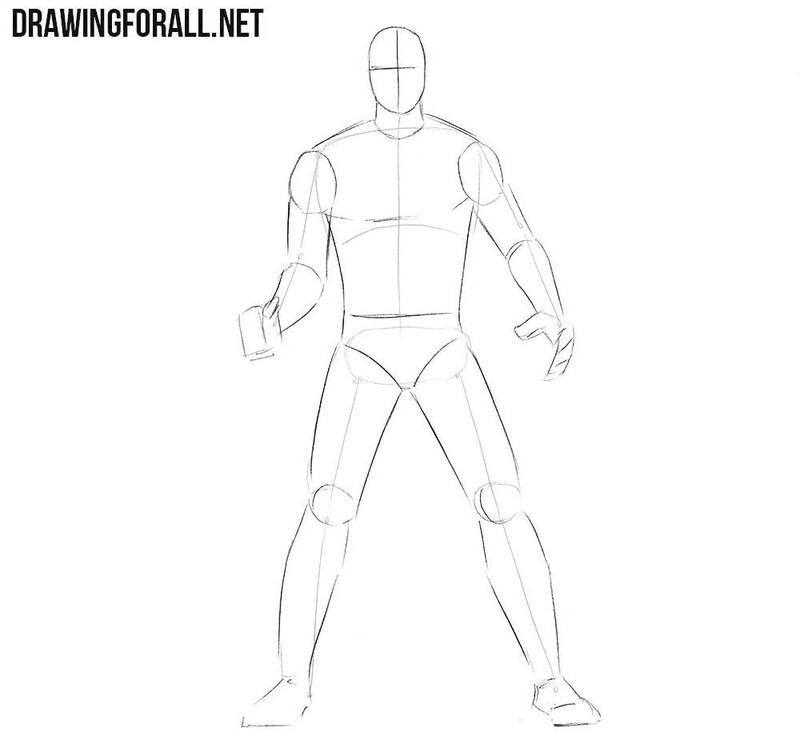 Draw all the necessary folds and remove unnecessary guidelines from the torso. So, let’s move to the arms now. 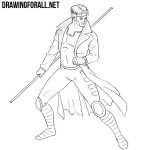 Using the same dark and clear lines, carefully draw out the outlines of the arms. Here we need to accurately draw all the folds, as shown in our example. In the same step we draw an unusual weapon in the hand and delete all unnecessary guidelines from the arms. Now we will do the same, as in the previous step, but with the legs. With the help of clear and dark lines, we need to carefully draw out the outlines of the pants. Draw all the necessary creases and delete all unnecessary guidelines from the drawing. 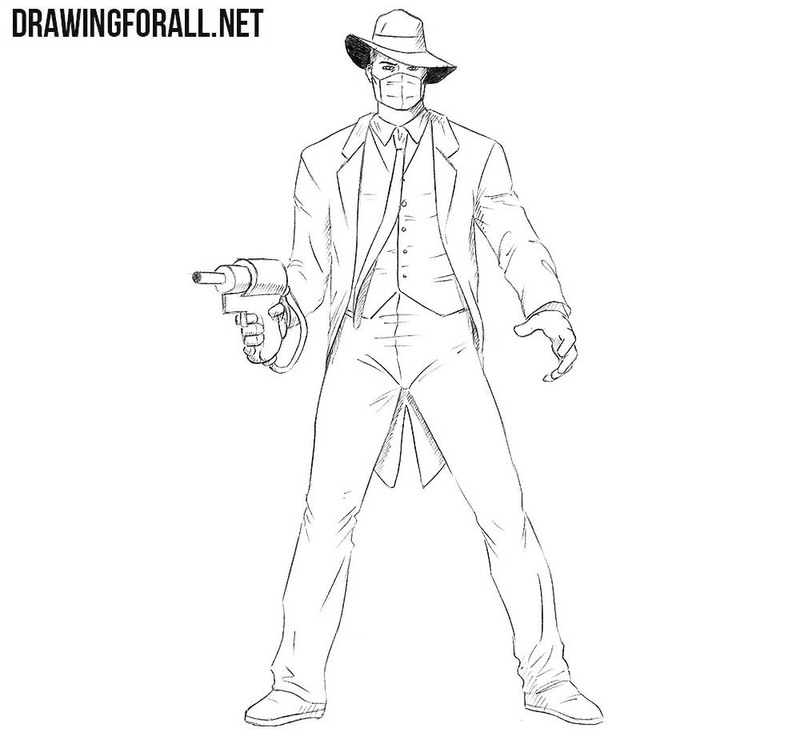 And the last step of the drawing lesson about how to draw Doctor Nemesis, in which we will traditionally draw the shadows. Paint the bottom surface of the hat in solid black. Next, using dense hatching draw the shadows in areas where no light is falling. We very often draw characters from comics. 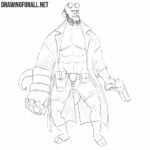 In general, we draw popular characters, but sometimes draw less popular characters, as in this lesson. Write to us who you want to see on the pages of our site. We are waiting for your comments under the article or in our social networks.